The long range summer forecast is for “above normal fun” on the Rideau. That’s going to be a lot of fun! We also have all our fingers crossed in anticipation of World Heritage Status. We should know in the last week in June, in time for the big bash in Ottawa on June 30. See you there! A couple of months ago we issued a challenge to FoR Director David Freeman. “Build us a working model of a lock small enough to fit into the back seat of a car.” Dave, an avid model railroader and a ‘handy bloke,’ took on this challenge. While FoR has a huge (8’ x 4’) model that weighs about a ton (it’s on a trailer), there is a demand for a smaller, more portable model. This is easier said than done, a big model is much easier to design and build than a small model, particularly if you actually want to fill it with water and have it work in a similar fashion to a real lock. We’re happy to report that Dave has achieved success. He’s developed a working model that is 4 feet long by 16 inches wide with a lock chamber about 20 x 4 inches. He’ll be demonstrating the model at our AGM on April 28. It could get wet - Dave suggests that you bring a snorkel! FoR Chair, Ed Bebee, and FoR director, Ken Watson, are both very pleased to announce the publication and immediate availability of their new books; Fish Tales and The Rideau Route. Both books shed new light on the fascinating history of the Rideau Canal Waterway. 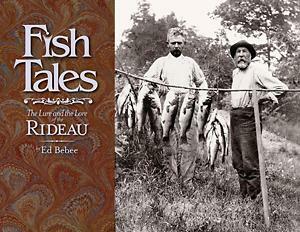 Ed’s book, Fish Tales, The Lure and the Lore of the Rideau features sketches and rollicking stories of legendary fishing guides and nine Rideau Corridor communities, shaped to share a sense of the world as they knew it. Chapters start with a quick sketch of the community to look at life and events – from the 1800s up to about 1960 in some cases. Guides talk about their experiences, other guides, their clients, and the realities of life. In his book, Ed visits nine communities: Delta, Battersea, Elgin-Morton-Jones Falls, Chaffey’s Lock, Newboro, Westport, Portland, Perth, and Smiths Falls-Ottawa; and tells the stories of those regions. For more info see the Fish Tales Page. Ken’s book, The Rideau Route: Exploring the Pre-Canal Waterway reveals the secret world that lies below the waters of the Rideau Canal – the drowned landscape of the original Rideau Route. Ken takes the reader on a 1783 canoe trip along the Rideau Route, from present day Ottawa to Kingston, revealing the rapids, waterfalls, marshes and lakes that existed prior to any European settlement along the route. Transcriptions and maps of Lt. French’s 1783 survey, as well as those of Lt. Joshua Jebb in 1816 and Samuel Clowes in 1823-24, are included as first hand accounts of the route. For more information see The Rideau Route Page. 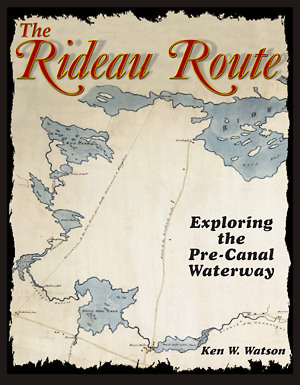 Both Fish Tales and The Rideau Route are now available for sale (only $24.95 each) on the FoR website: www.rideaufriends.com. Ed and Ken will be signing first edition copies at the AGM in Smiths Falls on April 28. We’re still waiting for the release of this updated chart. Latest word from the hydrographic office is that it will be available “in early May.” We will have it posted to our website as soon as it is available. Our volunteers spend many (many) hours on various Rideau projects. They get great support from our office manager, Nancy Lake, and from our Parks Canada liaison officer, Mary Ann Stienberg. A big thanks to Nancy and Mary Ann for all the help! The following article by Bill Pratt, Chief Engineer of the Rideau Canal, outlines a 3 year capital plan aimed at improving the condition of many of the Rideau Canal's heritage structures. In 2003, the Auditor General of Canada raised the red flag about the condition of many of our heritage sites, particularly many National Historic Sites under the jurisdiction of Parks Canada. The Auditor General noted the lack of legal framework to protect these sites and the lack of capital funding to maintain them. In 2007 the Auditor General noted that "satisfactory progress" had been made. Part of this progress has been to promise additional capital funding, of which the Rideau Canal is anticipating receiving its fair share. The Auditor General also noted why this is is important: "These places recall the lives and history of the men and women who built this country, and they foster awareness of how Canadian society evolved. They help us to better understand the present and prepare for the future. They contribute in important ways to Canadians' sense of belonging to their community. When important parts of Canada's built heritage are lost, future generations of Canadians are deprived of access to key moments of their shared history." The Federal Government has just come through an era of tight fiscal restraint, which has affected the Rideau Canal. However, we’re optimistic. For the Parks Canada Agency, Federal Allocations will ramp up to an additional $75 Million for Asset-based Capital expenditures by 2010. The Rideau has a 10 Year Long Term Capital Plan (LTCP) and we anticipate getting our fair share of the additional $75M. Our current LTCP anticipates that we will then be able to invest 1.0% of our Asset base per year versus the only 0.15% that we have been able to invest in recent years. We also have a new Engineering Team of five (5) Engineers and one (1) Technologist with over 100 years of engineering experience. We hope to have two additional staff on board by early in this Operation Season. This Team has experience in Heritage Conservation, Civil, Geotechnical and Mechanical Engineering for Bridges, Buildings, Fortifications and Marine Structures. The next three (3) years should be our best in a generation and we are cautiously optimistic beyond that time period. Kingston Mills Anglin Centre Access Washrooms. Wolfe Lake Fixed Bridge Replacement. As well as the above major Projects the Rideau Canal will be implementing Programs for Dam and Bridge Safety and, Fire Suppression Initiatives for Heritage Assets. The Dam Safety Program will lead to an additional $1.5 Million dollars worth of Dam Repairs in years 2008 and 2009. Further down the LTCP there is extensive work planned for Jones Falls Lock and Smiths Falls Combined Lockstations in years 2010 and 2011 respectively. We must remember that the above projects are only in the planning stages and ultimately depend on obtaining the necessary funding; however, we are definitely entering a new era of Heritage Conservation. Parks Canada has the resources, the expertise and the policy framework to conserve its heritage assets for the enjoyment of Canadians now and into the future. We will continue to keep you posted on significant developments. Meanwhile enjoy the Canal and our 175th Anniversary Celebrations ! In the early 1900s, Fishery Inspector J.C. Judd of Morton seemed to be everywhere, promoting conservation, good sportsmanship, and denouncing poachers, netters, and game hogs. He was enthusiastically praised in the local newspapers for catching and fining those who broke the fish and game laws. Judd was tireless in urging local communities to set up angling associations where public-spirited citizens could keep an eye on things. He was credited for setting up associations in Perth, Kemptville, and other Corridor communities, and trying to encourage visitors to come and enjoy the fine fishing along the Rideau. How did he manage to be in so many places and to detect so many lawbreakers? I think the answer is – he couldn’t be, he wasn’t, and he didn’t. So – who could be, was and did? The National Archives in Ottawa has the original rough 1901 journal kept by the skipper of the Eva Belle. ** There seems to have been a crew of three – the skipper, a pilot (sometimes), and an engineer. These were the people who were doing most of the game warden work. In fact, a lot of the dragging for nets was done from a small rowboat, often at night and in foul weather. The journal laconically recounts carrying the small boat to the Tay Canal to look for illegal duck hunters. Many days were spent rowing around lakes up and down the Rideau. From time to time, the Eva Belle would go to Morton to pick up Inspector Judd. This would mark trips down to Kingston Mills, Dog Lake, Cranberry Lake and the areas where illegal shipments of fish to the US were known to take place. In the summer of 1901, Deputy Commissioner of Fisheries Bastedo and his family arrived, and the Eva Belle took them to Garrett’s Rest. Over the next two weeks, when there was fair weather, Judd and the Deputy Commissioner assiduously inspected the neighbourhood as far north as Smiths Falls. When it was time to leave, the Eva Belle took the Bastedo family to Smiths Falls to catch their train for Toronto. There are all sorts of little details that throw light on what life was like on one of these steam yachts. An early entry in the journal mentions dryly that 500 pounds of pig iron was bought ($4.50) for ballast on June 14 in Smiths Falls. It was placed forward – “Found boat worked much better.” Maintenance and repairs were mentioned often. “Repairing the shaft coupling” occurred several times. On August 20th and 21st, the journal reported- “Patrol boat laid up at Westport for repairs. Worked all day and on 21st, rolling tubes on crown sheet of boiler. Boiler in good repair after above work done.” A month later, there was another journal entry – “Friday 27 at Morton weather fair. Lay at Morton to make some repairs to Boiler of yacht.” Another update to the yacht occurred the next day. “Spent forenoon getting small coal stove in after cabin of yacht.” The Eva Belle probably used only wood stoves up until then, since there were occasional mentions of taking on part of a cord of stove wood – consistent with using the wood only for cooking and heating. * William Robinson of Kingston built the Eva Belle in 1892. It was almost 40 feet long, with an 8 foot beam and a shallow depth of less than 3 feet. It was sold to the Department of Fisheries in 1905. Edward Forbes Bush, Commercial Navigation on the Rideau Canal, 1832 – 1961. History and Archaeology 54. National Historic Parks and Sites Branch. Parks Canada. Environment Canada. pp 183-4. ** “Rough Journal of a fisheries inspector on the Rideau Canal, 1901”. Library and Archives Canada. Reference MG9-D8-68 Volume 30. From the perspective of our world of Google Earth, GPS systems, and maps on line, its hard to imagine traveling without navigational aids. No doubt, people like Samuel Champlain and David Thompson had well honed skills for reading the land and waters and they were wise enough to incorporate the Indigenous Ecological Knowledge (IEK) of the First Nations they encountered. For we week-end voyageurs, however, maps are welcome aids when we venture beyond our familiar stomping-grounds. And this was particularly true for the first to travel the Rideau. As we saw in the last issue, attention was first directed to marking the channel, albeit with somewhat improvised devices. Of course, with time and experience, commercial operators and locals alike developed expertise in finding their way through the waters and the forests of the Rideau. Thus, in 1898, a potential visitor from Newark, N.J. enquired about charts for the Rideau for a proposed “yachting trip.” Superintendent Phillips suggested that “you follow the usual practice of the many yachting parties which come over every year from the United States & that is engage a pilot who will be able to take you all over the lakes as well as through the steamboat channel.” He went on to suggest contacting Captains Donelly and Noonan at the Chaffey’s Lock post office for names of potential pilots and their daily rates. 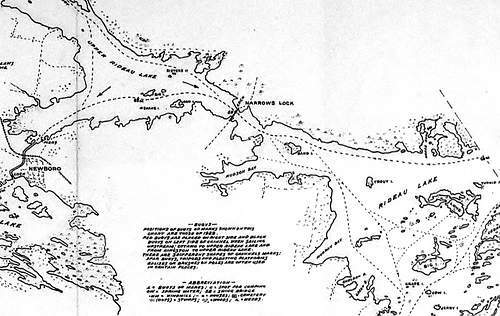 By 1919, navigational charts of the Rideau were available through the Hydrographic Service of the Department of Naval Service. Henceforth, Phillips would direct enquiries to a Mr. Henri Melancon in Ottawa for the “better series of plans” at $7.00 a set, while $2.00 would get you a general map of the Rideau from Dr. Elmer Lake of Kingston. By 1832, while the Department of Railways and Canals still did not issue charts, the Department of the Interior supplied a two-part chart which indicated the route of the canal and the location of 465 spar buoys. With these charts available, and with a formalized system of navigation aids and practices in place, detailed knowledge of the routes and hazards was made available to the public and taken away from the legerdemain of a few captains, pilots, and guides. But the latter still knew where the best fishing spots were!